It was a beautiful day to be a nurseryman. We were able to work on our own landscape today. We have been cutting down Mulberry trees, Honeysuckle bushes, Hawthorn, and a lot of Black Locust. Yuck! These plants start out as little guys and gals that can be cut down with a pair of loppers. If you don’t get them when they are small, before you know it they are 15′ tall and then 22′ tall! Now it’s chainsaw and wood chipper time! They have become very expensive and time consuming to remove. I waited way too long! I will never let these plants get out of control again! The only good Mulberry around here is a dead one. However, I do like the berries they produce. Lots of people are unaware of how good these berries are once they ripen-not too sweet and not too tart! The birds like them as well and disperse the seeds all over the place. Apparently, the seeds don’t digest well. Regardless, they must go! On another note, my dad ordered some Thornless Honey Locusts about 25 years ago. The nursery, by mistake, sent him Black Locusts seedlings that are thorny. Unfortunately, it’s impossible to tell which kind they are when they are young. Seven or eight years later these plants developed thorns. Major bummer! There were some plants that were not thorny, but they were in the minority. Now these trees reseed themselves very aggressively. They do have two outstanding attributes though. First, they bloom with lovely, fragrant, white Wisteria type flowers in the Spring. Second, they make great firewood from what I have read on the Internet. There is actually one cultivar of the Black Locusts called ‘Purple Robe’ that produces beautiful purple flowers. I am not sure if this variety is seedless or sterile. I also have a Russian Olive and Honeysuckle problem. I have no idea where they came from. They are all over the place and spreading fast! They have no redeemable attributes. They definitely must go! We did have to cut down some plants I like, but they had to be stump cut. Stump cutting is when you trim a shrub to the base of the trunk and then let it grow back. This drastic procedure removes the nasty old growth and enables new growth to come up and have the space it needs to thrive. Hopefully, after all that work, the plant’s aesthetics improve. We did this purposely to some really old Lilacs and accidentally to a couple of Weigelas. You can do this to a lot of different shrubs, even some Hydrangeas and Ninebark. Sometimes the results are good, and other times this procedure gets you one step closer to getting out the stump grinder and permanently erasing the plant from your landscape. On the last day of cutting down the Black Locusts at the back of the nursery property, I had an unexpected visitor. 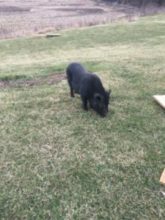 My neighbor’s pig got loose, and he wandered down to our work area. My neighbor also has a black Labrador Retriever. Out of the corner of my eye I saw this black creature moving in the brush. I figured it was the dog, but something about the shape of the animal was just not right. It was Piggy! I called my neighbor, who was at work at the time. He explained to me if I just called Piggy, he would walk back to his pen like a dog, and that is exactly what he did!